Note: See our Specialized M16 Gallery for other stunning Eagle Nebula images. 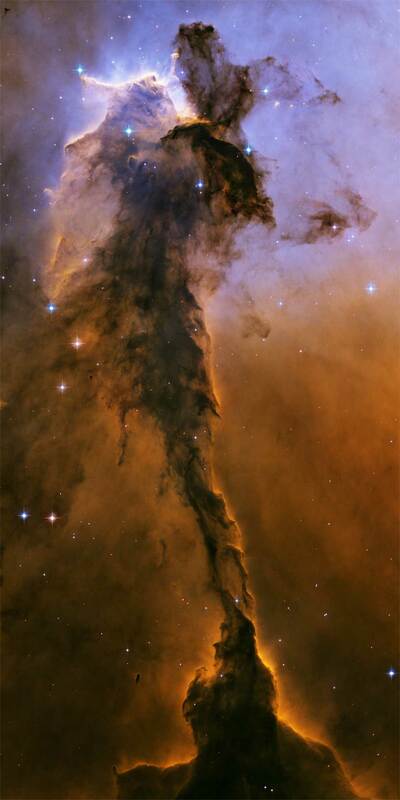 STScI-PRC2005-12b - Appearing like a winged fairy-tale creature poised on a pedestal, this object is actually a billowing tower of cold gas and dust rising from a stellar nursery called the Eagle Nebula. The soaring tower is 9.5 light-years or about 57 trillion miles high, about twice the distance from our Sun to the next nearest star. Stars in the Eagle Nebula are born in clouds of cold hydrogen gas that reside in chaotic neighborhoods, where energy from young stars sculpts fantasy-like landscapes in the gas. The tower may be a giant incubator for those newborn stars. A torrent of ultraviolet light from a band of massive, hot, young stars [off the top of the image] is eroding the pillar. The starlight also is responsible for illuminating the tower's rough surface. Ghostly streamers of gas can be seen boiling off this surface, creating the haze around the structure and highlighting its three-dimensional shape. The column is silhouetted against the background glow of more distant gas. The edge of the dark hydrogen cloud at the top of the tower is resisting erosion, in a manner similar to that of brush among a field of prairie grass that is being swept up by fire. The fire quickly burns the grass but slows down when it encounters the dense brush. In this celestial case, thick clouds of hydrogen gas and dust have survived longer than their surroundings in the face of a blast of ultraviolet light from the hot, young stars. The bumps and fingers of material in the center of the tower are examples of these stellar birthing areas. These regions may look small but they are roughly the size of our solar system. The fledgling stars continued to grow as they fed off the surrounding gas cloud. They abruptly stopped growing when light from the star cluster uncovered their gaseous cradles, separating them from their gas supply. Ironically, the young cluster's intense starlight may be inducing star formation in some regions of the tower. Examples can be seen in the large, glowing clumps and finger-shaped protrusions at the top of the structure. The stars may be heating the gas at the top of the tower and creating a shock front, as seen by the bright rim of material tracing the edge of the nebula at top, left. As the heated gas expands, it acts like a battering ram, pushing against the darker cold gas. The intense pressure compresses the gas, making it easier for stars to form. This scenario may continue as the shock front moves slowly down the tower. The dominant colors in the image were produced by gas energized by the star cluster's powerful ultraviolet light. The blue color at the top is from glowing oxygen. The red color in the lower region is from glowing hydrogen. The Eagle Nebula image was taken in November 2004 with the Advanced Camera for Surveys aboard NASA's Hubble Space Telescope.